Colleen Huth folds her clay, leaving an organic edge, and dips it in a rich green and blue glaze. In the wild, thirsty baby animals need to follow their mother's lead to the watering hole. 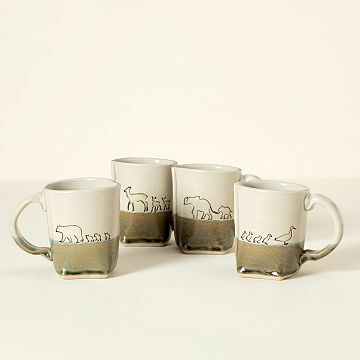 Celebrate mom's guidance and nurturing that carries on even after we grow up with this sweet mug by Colleen Huth. Handcrafted from stoneware, the unique design starts as a flat piece of clay. Colleen then presses it with a custom stamp of elephants, geese, bears, or deer, folds it leaving an organic edge, and dips it in a rich glaze that forms a gradient when kiln-fired. Finished with a sturdy handle, it gives her morning coffee or afternoon tea a playful touch. Handmade in Fond du Lac, Wisconsin. Glazes will vary from light to dark as depicted in the photo due to the artist making each mug by hand. Colleen Huth is a self-taught slab pottery builder from rural Wisconsin. She started out with a love of drawing and painting early in life, and received a degree in 2D design. After college Colleen found a part time job at a pottery studio, where she realized her passion for ceramics. There, she had limitless space and materials to learn her craft. She chose to pursue slab building because it allowed her to incorporate her 2D design skills. Colleen’s inspiration comes from the natural world around her and the need for functional objects. All of Colleen’s work is high-fire stoneware. Each piece is slab-built and pressed with hand-drawn stamps, antique lace, or flowers. Colleen started off selling her work at local retail craft shows, and after a few short years, her work is now displayed in galleries across the nation. She now works from her home studio, filling orders and cultivating new ideas every day.